In a departure from the trend established when The Mirage opened of providing sidewalk attractions to draw in customers, Wynn Las Vegas is constructed so that visitors must enter the building to view the attractions. The main attraction is a large, curtain waterfall behind a mountain that faces the strip. The waterfall falls into a 3 acres (1.2 ha) lake. The show can be viewed from the Parasol Up (a bar and viewing area), and can be viewed through a glass window with no audio. Or, the show can be viewed from Parasol Down, with a larger view. Visitors can go to the platform at the Parasol Down bar to view the show with full-volume audio. Those dining at SW Steakhouse or the new “Lakeside Grill” Restaurant may also have a full view of the show while dining. The Wynn Casino is hardly the first hotel you think of when it comes to free entertainment, but the Wynn Resort Lake of Dreams Show is just that. 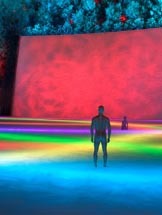 Spanning over 20,000 square feet, the production employs thousands of underwater LED fixtures to construct a show that combines color and water with remarkable results. Putting the Wynn Resort Lake of Dreams show just inside the hotel was done exclusively to bring in more tourists. Unlike other aspects of the hotel, this one does not disappoint. When you first venture into the Wynn lobby, you can only glimpse the backside of the Wynn Las Vegas Lake of Dreams. A tree-covered mountain dominates the view, and as you pass into the main area, the lush peak overlooks a series of lazy waterfalls and refined lagoons. The Lake itself is three acres in volume. When the Wynn Resort Lake of Dreams show is not on, the water lies still, tranquil. Gentle streams trickle towards the lake.